Climate Change and Nursing is a video series, produced by Dr. Barbara Sattler, RN, DrPH, FAAN and Michelle Ruiz, MA, Instructional Designer, that introduces the health threats posed by climate change and the associated actions that nurses can take. Certain populations will be extremely vulnerable to health impacts from climate change including children, the elderly, communities of color, low-income populations, and those with chronic health conditions. Additionally, with the range of climate regions across the United States, climate change will pose variable risks throughout the country. 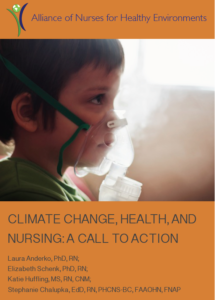 Refer to ANHE’s 2016 report titled “Climate Change, Health, and Nursing: A Call to Action” for a further review of the science of climate change and relation to health, specific health impacts by U.S. region, and more information on how nurses can get involved in addressing this issue. The National Climate Assessment provides information on the current and projected impacts of climate change in the U.S., developed by a team of more than 300 experts and reviewed by the public and experts. Access past reports of the Intergovernmental Panel on Climate Change to review the evidence base for climate change. Learn how to apply health promotion interventions in caring for the planet a nd the systems in which human existence depends at Planetary Health Now! 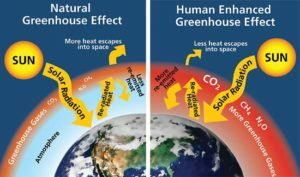 Center for Climate Change and Health resources on climate, health impacts and inequities, and how climate change is a health opportunity, with climate action providing co-benefits for communities. 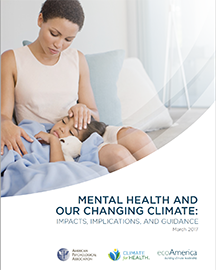 ecoAmerica and the American Psychological Association’s report: Mental Health and Our Changing Climate: Impacts, Implications, and Guidances. The Center for Climate Adaptation Science and Solutions provides various Spanish-language resources related to climate change including the National Climate Assessment, the IPCC 5th Assessment Report, and the Southwest Climate Assessment Report. Learn more about some of the cross-sector initiatives across the world aimed at improving health through addressing climate change in the report, Multisolving at the Intersection of Health and Climate: Lessons from Success Stories. The Climate Policy Info Hub, a group of independent climate policy researchers, provides a summary of climate mitigation and adaptation strategies. The Climate Atlas of Canada provides information on climate science, interactive maps, and stories of climate impacts across Canada.